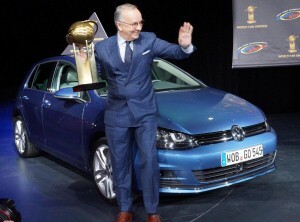 As prestigious titles go the Car of the Year is the most important and in New York the title went to the VW Golf. The VW Golf is a cracker and deserves to win – it beat fellow Germans in the shape of the Mercedes A Class and the Porsche Boxster and Cayman. Other finalists included the Toyota GT 86 and Subaru BR-Z sports cars. Make no mistake, all of these cars are worthy contenders but the VW Golf is Europe’s best-selling car, which is also a big global success, and deserved to win. Martin Winterkorn, the chairman of Volkswagen, said: “We are delighted that the VW Golf has been named ‘World Car of the Year’. To win this award again shows that the Golf is and remains in a class of its own all around the world. For over 30 years, the VW Golf has been an established feature of the motoring scene around the globe. For the seventh generation of the bestseller, today’s prize represented its 17th award since being launched in November 2012. It was only three weeks ago that the compact car from Wolfsburg was crowned European Car of the Year. Further accolades from home and abroad, such as ‘The Best Cars of 2013’, ‘Auto Trophy 2012’ and the ‘Top Gear – All the car you’ll ever need’ award, round off the list of successes. The ‘World Car of the Year’ jury consists of 66 motoring journalists from 23 countries, who rate new cars appearing on the world market not only for the award, but also in their daily reporting work for millions of drivers and car enthusiasts. The model before the current Golf won the renowned prize back in 2009. Over the coming months, further models will be added to the VW Golf range: the Golf GTI and Golf GTD, two sportier versions, are being launched in the spring. Customers will also be able to order the new, dynamic and spacious VW Golf Estate. Following this in the second half of the year comes the new VW Golf TDI BlueMotion, which sets new standards in terms of fuel consumption and environmental compatibility. They didn’t ask me for my vote but I can’t dispute the VW Golf’s status since it’s a great car but I would urge anyone thinking of buying one to check out the car leasing packages for the VW Golf before actually spending any money. This entry was posted in Family Car, Manufacturer News, News and Views, Popular Cars, Small Car and tagged Auto Trophy, best selling car, car, car leasing, Car of the Year, Europe, Golf, Golf GTD, lease a vw golf, Martin Winterkorn, New York, Porsche Boxster, Volkswagen, VW, vw golf, vw golf car of the year by Steve Lumley. Bookmark the permalink.